Just a simple list of maintenance tasks that I regularly use and carry out. I found a bug with the Kaspersky Removal Tool. 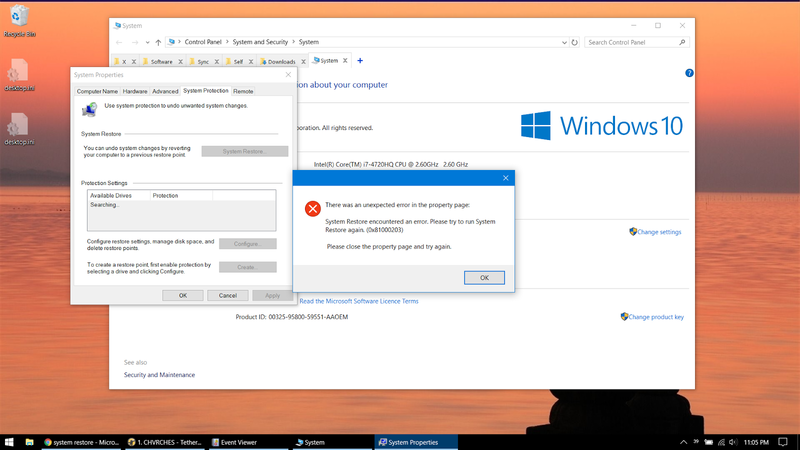 It will break System Restore on Windows 10. I've reproduced this on 4 different machines. The error message appears as below. There was an unexpected error in the property page. System Restore encountered an error. Please try to run System Restore again. (0x81000203). Please close the property page and try again. 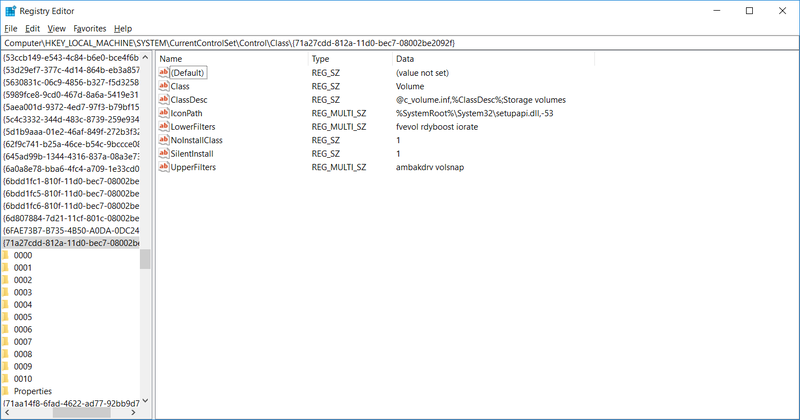 After exporting the registry before and after and then comparing, I found the UpperFilters were deleted for the Storage volumes class. As far as I understand it, you need both Upper and Lower Filters in any given case. 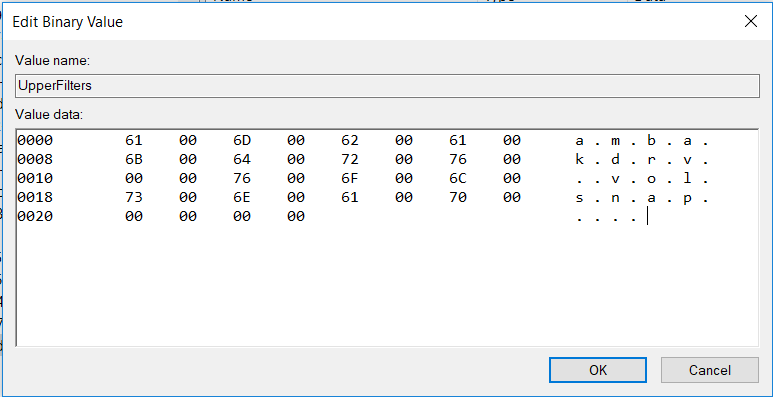 To apply the fix, copy the following blue text, paste it into Notepad, save it as "repair.reg", then double-click to Merge it with the registry. 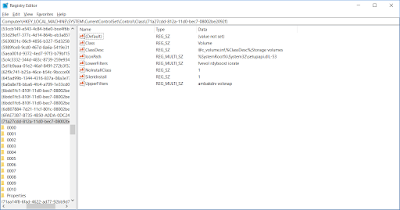 If you run a hex to ASCII converter over this value, then the text is "volsnap", which corresponds with the volume snapshot service/driver, which is what System Restore uses to copy files. 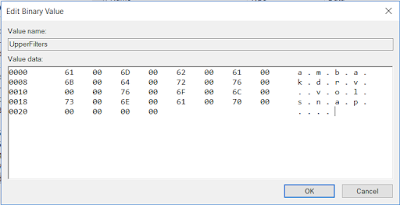 Note that some other backup software may not work after this, such as Aomei Backupper, which also has the driver ambakdrv and makes the hex as seen below. I would suggest reinstalling your backup software to correct this. After applying this, restart the machine and try to open System Restore again - the error will disappear. This error is also caused by other programs like TuneUp Utilities - see this Microsoft support page. 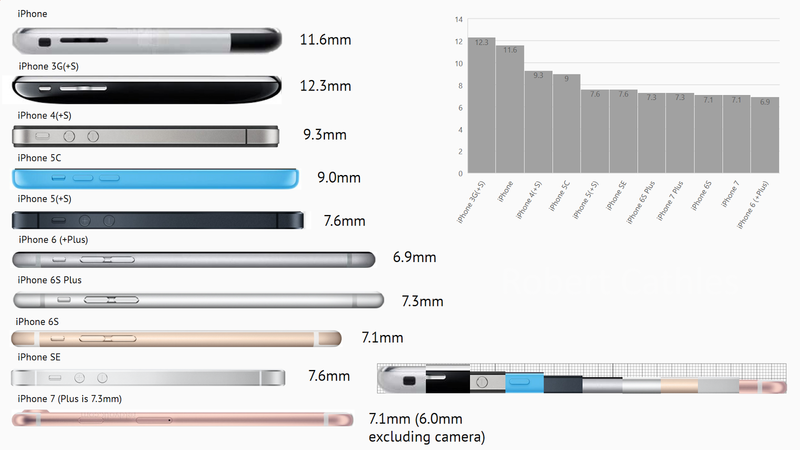 Nice little infographic I made of iPhone "thinness" over time. Council properties will be repurposed into standard housing and put on the market. Current council flat dwellers will be moved to live in portacabins if they cannot afford rent. Target of 100% national employment rate should be achieved by 2025 which includes those on benefits. People on benefits must find paid or voluntary work (now mandatory) of some description even if it is online or community service. Transport will be improved for all locations e.g. buses and trains. All buses and trains must now accept contactless only - coins and paper are now invalid. Only reusable cards can be issued by a cashier, if they are not intended to be kept then they are reused as temporary cards. Every station must now have a card reader, and a map of the local nearest facilities (toilet, defibrillator, seating), and must have a vending machine with essentials like water. All buses must now be running on 100% renewable energy. LED lighting will also be used. Wi-Fi should also be at 100% UK coverage by 2026. All trains should be running on 100% renewable energy by 2036. Same again for lighting and Wi-Fi. Before putting down a deposit, I'd recommend following up on the following topics at your viewing, with the landlord or agency. For more information and guidance, see gov.uk. Rent - What is your total income minus rent, bills, food, insurance, travel, etc. Can you really afford it and save up enough for the future? Furnished - What stays and what goes? Things like beds, tables, television, microwave, washing machine/tumble drier, sofas, chairs, desks, racks. Other viewings - How many other people have been or are coming to see it? From this you'll know how fast you need to respond. All bills - Some contracts may advertise all bills but actually don't - often TV Licence is excluded, but from 1st Sept 2016, TV licences will be required even if you don't watch live TV. Share bills - Are you all sharing the bills, who is in charge, and where does the money go? Cleaner - Is there a cleaner for communal areas and perhaps your own room? Is there a rota for all housemates to cover, and who buys cleaning products etc.? Landlord availability - How long does it take for the landlord to sort things out? Does the landlord ever live in? Generally I wouldn't recommend these. If you have issues what is the process - Estate Agent first or landlord first? Usually it depends on the issue. Why moving out - Why is the room available? 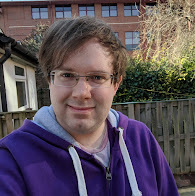 Why did the person move out? Parking - Is there on-land parking, on-street parking, and parking for visitors? Are permits needed? Police.uk - Check this website for crime rates and types in the area. Security history check - You are allowed to ask the agent if there have there been any burglaries or any other criminal activities recorded at the property within the last couple of years. You can also ask the police or firemen to inspect the property for weaknesses. Door and window security - Do all external-facing doors have a rim/mortice lock or a rim latch lock, or a lever handle lock? Each have varying degrees of safety and how easy they are to break in. Keys - Do you get your own set of keys for your room, windows, and other doors? Windows - Do they all open, are they clean, who cleans them? Street lamps - Are there visible street lights from the window that could distract you in the night? Is there adequate street lighting at all for safety? Are there security flood lights? Damp, mold, condensation - Check for moist walls, especially against the walls that on the building like near windows. Also check for where sections of walls have been painted over as this may be to cover up damage or damp. Insurance - Do you have enough that you want to be insured? Fire extinguishers - (only required if H.M.O. property so flats don't usually apply) Are the indicators in the green zone? Is there at least 1 on every level? Fire exit - Is there a clear exit on every level? Fire/smoke alarm - Is there one and is it working? Note that some alarms are multi-function, so a carbon monoxide alarm may also detect heat or smoke. Carbon monoxide detector - (Gas property only) Is there one near the boiler and is it working? Gas safe - Are the boilers gas safe and checked within the last year? British Gas Home Care - Is the property covered by this? I'd recommend it for immediate and professional cover of gas/electric issues. Pets - Are you allowed to keep or bring over pets? Partners and guests - are you allowed to have anyone over? Friends, guests, partners etc. How many nights per week is too many? Rubbish and recycling - where are they bins stored and how often are they emptied? Who's job is it to take out the rubbish? Storage - What's the policy on storage, and is there enough room for all your stuff? If not, will the landlord allow you to get cabinets or an Otterman bed? Noise - Are the windows double-glazed? Is it noisy in the area - do you need silence to sleep? You're looking for traffic noise from nearby roads and motorways, noisy neighbours, and transport like trains and airports nearby. Sunlight - Is the sunlight coming into your room - would it be a distraction - or is there no sunlight at all. Too much will discolor the walls and not enough means the room might be colder. Washing and drying - Is there a washing machine, dryer, and what is the policy on using airers/horses in your room/other rooms? Bathroom - Is there an extractor fan and if so, is it working? Hot water - How long does it take to get hot water from a tap? Is it mild or piping hot? Latest router and specs - How old is the router? Newer ones are likely to be dual band, and grade b/g/n/ac. Lighting replacement - who will replace the lightbulbs and batteries for fire alarms etc/? Are any of the light fittings loose or not working? Wall mounts - Are you allowed to pin or stick anything up? Often white-tac is allowed, but some places may give permission to pin things up like paintings or hooks for keys/jackets. Plugs - Are there enough of them in the room, are they in good condition, and are they in a good place for where you stuff will be? Extra switches - sometimes properties have extra switches next to the lights, what do they do? More on my Spotify Playlist. These are probably all good contenders for my funeral to be honest.